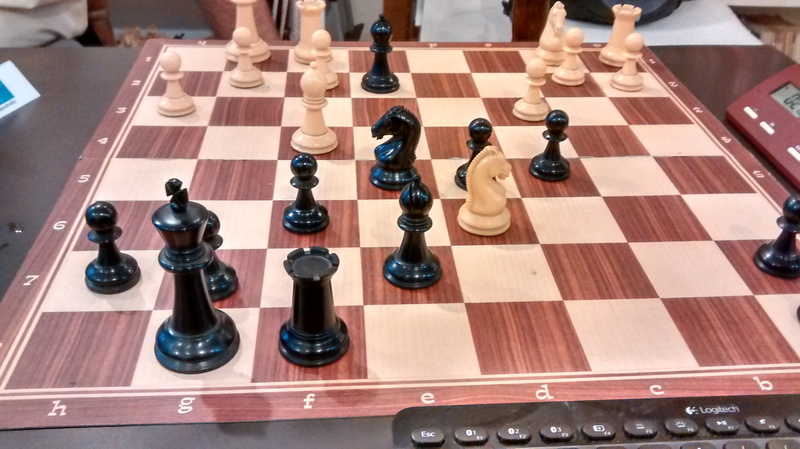 As my third year as partecipanti at The G-Sei live tournament I used the “beta” version of AdaChess. The release is still not complete but enough stable to let me play using it! This year the tournament was originally organized in Norcia, a small tawn in the center of Italy, but the recent earthquake that hit places near there made us moving to Rome. Our friend Stefano, author of Satana, who lives in Norcia, wasn’t able to participated in person with us but he gave us its engine ad we used a laptop to let him play anyway, thanks to Edoardo – that is the author of RamJet, who played with both engines at the same time. As our special guests we were pleasured to host 3 engines from other countries that are Booot from Ukraine (written in Delphi by Alex Morozov), Floyd from Belgium (wiritten in C by Marcel von Kervink) and The Baron from Netherland (written by Richard Pijl) . All of them are really strong! 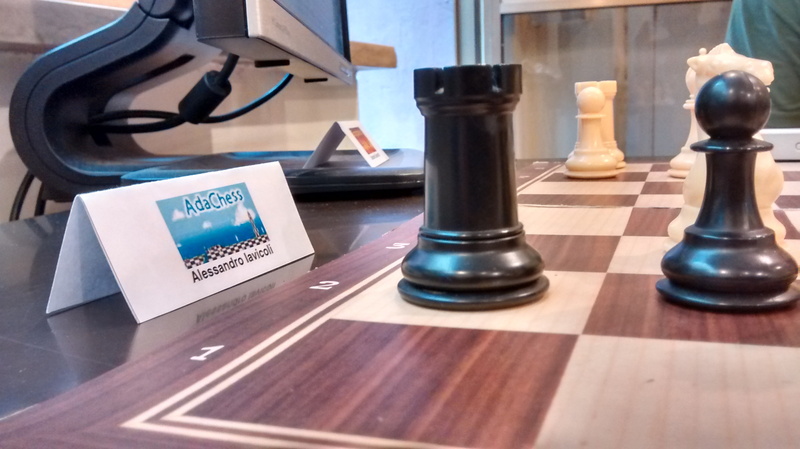 Technically speaking AdaChess improved its thinking performance in “medium-time” blitz games by doubling the searching nodes per seconds and by reaching 2-3 ply depth more than the current release. I think I should be happy about that! 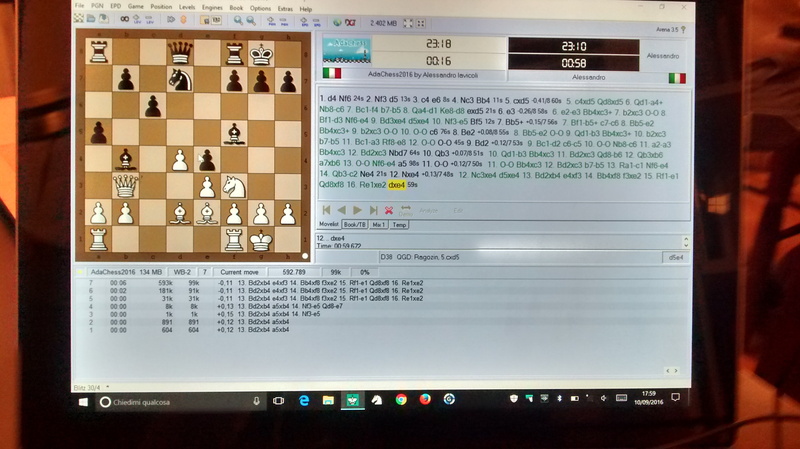 The improvement that made this possible are the use of transposition tables plus the late move reduction search. The new move generator has greatly improved and the evaluation of quiet position is smarter than before. I’m now testing some new interesting features like the SEE and some kind of King safety decisions. The tournament has been a nice gym anyway! As a news, as soon as I will release the complete new engine version, I will move the source on my github account where you can find every upgrade on each intermediate steps. Currently, the code has been rewritten in many parts to be more Ada-idiomatic and it is really well commented. The code clarity has always been one of my main purposes while writing the engine. Talking back to the tournament, the rating score can be found on the gsei site, as well as the post I perché di un gruppo – The reasons of a group – with a summary of the weekend. Special thanks, also, to the new arrived Giovanni Di Maria with its engine, Acqua, a very simple but nice and interesting engine written in Horbour. Giovanni gave us many nice gadgets made of wood and was the sponsor of the tournament!